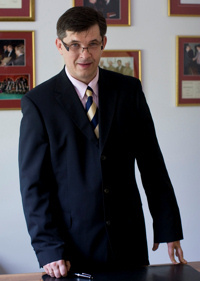 Professor Wojciech Roszkowski, Ph.D. Professor Marian Marek Drozdowski, Ph.D.
On behalf of all musicians of the "Sonata" Bogumił Łepecki Warsaw Symphony Orchestra as well as on my own behalf, I would like to express my most sincere gratitude to all of the eminent personages who have been so kind as to become our patrons of honour, led by His Eminence Cardinal Józef Glemp, the Primate of Poland. It has been a great honour and pleasure for us all to be able to perform our music under such illustrious Honorary Patronage. Marking the twentieth anniversary of the educational and artistic activities of our orchestra, the year of anniversary celebrations formed a perfect opportunity for the Orchestra to present nearly 60 works by Polish classical composers (including composers of patriotic works) to both our Polish and international listeners, thereby not only expressing the devotion to our Nation, but also paying a clear homage to the magnificent achievements of Polish composers. I therefore ask that you accept our gratitude – expressed as aforesaid – for supporting our National Culture and Heritage by sponsoring the "Sonata" Bogumił Łepecki Warsaw Symphony Orchestra between 1984 and 2004, and once again present my sincere thanks to all Government and Local Government Institutions, State Corporations and Enterprises, Private Companies as well as the Media, both state-owned and private.